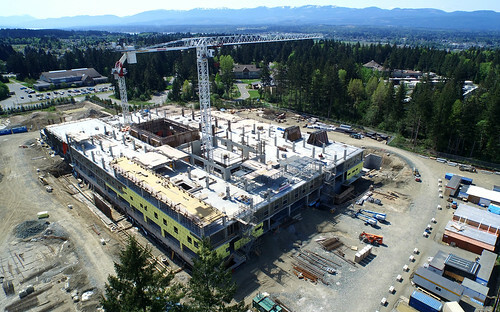 The new Campbell River Hospital construction site dwarfs the existing Campbell River Hospital, upper left, as seen May 3, 2015 from the southwest corner, with Discovery Passage and Quadra Island in the background. Only ten months after the start of construction, both structures are well on their way to completion and move-in by late 2017. Later this summer, roughly a year after construction began, crews will finish concrete pouring for the two structures, an impressive 18,000 cubic metres of concrete – or 1,800 truckloads – for the new Comox Valley Hospital, and 15,000 cubic metres of concrete – or 1,500 truckloads for the new Campbell River Hospital. 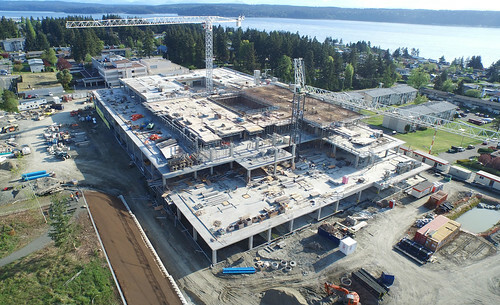 All 33,000 cubic metres of concrete is coming from local producers, Cumberland Ready Mix is supplying the concrete and trucks for the Comox Valley Hospital while a local joint venture between Uplands Ready Mix and Island Ready Mix is supplying the concrete and trucks for the new Campbell River Hospital. The North Island Hospitals Project is also providing many training opportunities. There were 81 apprentices working for the hospitals project in April, including plumbing, carpentry, iron workers and electrical. “The project team and Tandem have been working with the Provincial Government, School Districts, North Island College, the North Vancouver Island Aboriginal Training Society, employment foundations, trade associations and others to develop apprenticeship and other training programs and employment opportunities to maximize economic and training opportunities,” Sparrow said. The Comox Valley hospital site on May 3, 2015 as seen from the northeast corner, with the Comox Valley Aquatic Centre upper left, North Island College upper right, with Courtenay, Comox and the Beaufort Range stretching into the distance.